Last month we saw the release of Chrome Canary for Android to the Google Play Store. The pre-developer release allows public users to preview upcoming features and provide feedback to developers to resolve bugs and security issues. Upon the release, we stumbled upon a new flag labeled “Chrome Home.” After enabling the flag, we found that the omnibox (url bar) had been relocated to the bottom of the Chrome browser. 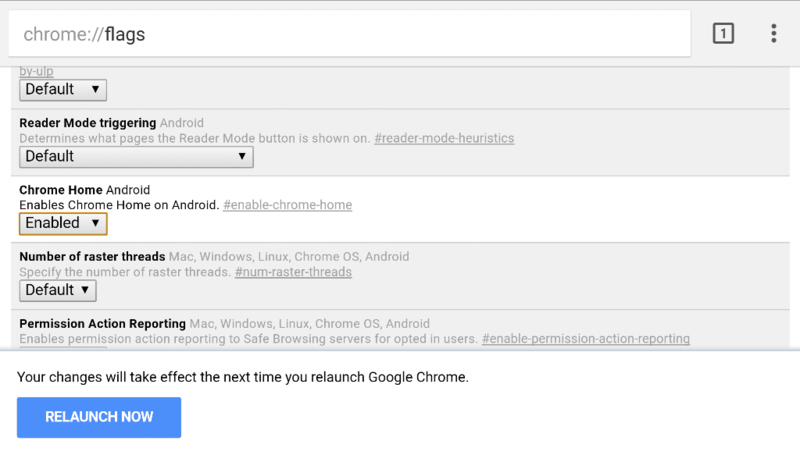 A recent update to the developer version of Chrome for Android has now added this feature. It seems it is being received well by the mobile community as it makes its way through the Chrome ranks. Hopefully, as it is fine-tuned, we will see the option brought to the stable build of Google’s mobile web browser. As stated before, with the average phone screen now over 5 inches having the omnibar at the bottom definitely has its advantages. If you’d like to try out the new bottom url feature head over to the Play Store and download Chrome Developer for Android. You can install the Developer build along side Stable and use either or both at your discretion. Once you’ve installed the Developer build just type or paste the following into your omnibar and you are all set. To reset the omnibar to the top of the browser follow the same steps with the code below. What do you think? Could this be a useful addition to the Chrome toolbox?